I watched a horror film last night, however, it was not Jaws or The Texas Chainsaw Massacre. 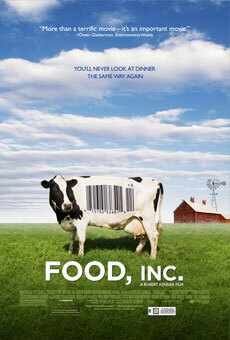 It was a documentary that could easily be put into that category of films, it was called “Food, Inc”. If you’ve never seen it, I urge you to rent it. Just like the website says “You’ll never look at dinner the same way again”. This film was definitely an eye opener. Watch it if you get a chance. Jim and I watched that a few back as well. We had been trying to take on a more 100 mile diet anyway but after watching this…. we have a few choices for farm near us but we are definately making different choices about buying meats that are pastured and feed only certain grains. The part that floored me was about the seeds…..that is just plain crazy!